Adrianne Lenker has been writing songs since she was 10 years old. Her “back story” has been well documented in various interviews and profiles for Big Thief over the last 3 years. Despite, or more likely because of the constant touring and studio work, the last few years have been some of the most prolific for Lenker as a writer. Songs pop out at soundcheck. They pop out on late night drives between cities. They pop out in green rooms, hotel stairwells, gardens, and kitchens around the world. In the hands of Lenker, songwriting is not an old dead craft. It is alive. It is vital. With little regard for standard album cycle practice or the idea of resting at all, Lenker set out to make a document. 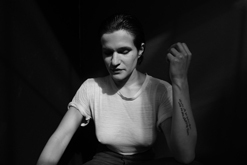 Songs can be slippery and following 2+ years on the road with Big Thief, Lenker felt a growing need to document this particular time in her life in an intimate, immediate way. The result is her new album, abysskiss, via Saddle Creek. We’re very excited to see the response to this video, and we’re confident that you’ll be captivated by this clip like we’ve been. Please contact Andy Gesner and the HIP Video Promo team at (732)-613-1779, email info@HIPVideoPromo.com, or visit www.HIPVideoPromo.com, www.Saddle-Creek.com, or www.AdrianneLenker.com for more information including upcoming tour dates and more.